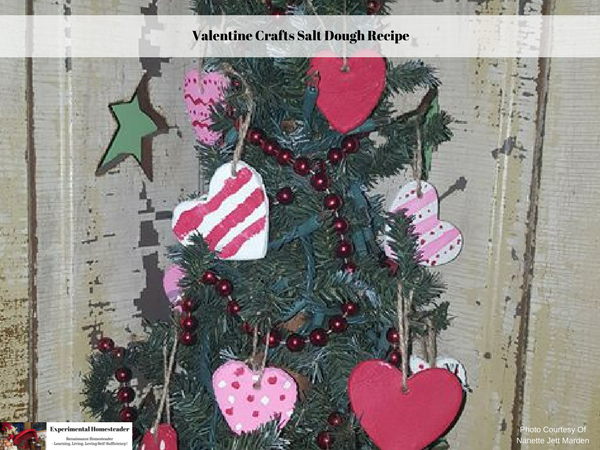 A fun way to show off your valentine crafts is by using a combination of bows, feathers, flowers and handmade ornaments such as the ones made with this salt dough recipe shared below to decorate an evergreen tree for Valentines Day. Salt dough ornaments are easy to make, simply make up the recipe, roll it out and use cookie cutters to cut out the shapes. Then all you have to do is bake them, let them cool and decorate them however you wish. 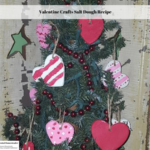 This is a great craft for kids, but be sure to offer some adult supervision, especially when the ornaments are being baked and removed from the oven to cool. An old plastic tablecloth makes a great work surface and for those working with young children, putting a plastic tablecloth on the floor under the chairs makes for easy cleanup especially if there is an accident such as a paint spill. Here is the recipe my friend Nanette shared with me. Combine the flour, table salt and water together to make the dough. If it is too sticky add a little more flour. Decide how many colors of salt dough you need and divide the dough up. Place the dough into separate non-food containers, put on plastic gloves to keep your hands clean and add the paint. Use your hands to mix the paint into the salt dough. Be sure the color is vibrant because it will fade. I suggest choosing a color two to three shades brighter than what you want. Shape the dough with your hands or use cookie cutters to cut out shapes. Cookie cutters give a more uniform appearance to the finished ornaments. Use an unsharpened pencil to make a round hole in the top of the ornaments to allow them to be hung once they are dry. Place the shaped dough onto a parchment lined cookie sheet. Preheat the oven to 150 degrees Fahrenheit. Place the cookie sheet in the oven and turn it over every 30 minutes. Check the dough once an hour to see if it is dry. Typically the dough is dry in two hours. Once the dough is dry place it on a wire rack to cool. It is ok to leave it on the wire rack for a couple of days if you wish. Seal the front and back of the ornaments with Modge Podge. I suggest two to three layers of Modge Podge per ornament. For those who want to add pieces of paper, fabric or glitter, place it on the first layer of Modge Podge while it is still wet, then add the additional two layers of Modge Podge per the instructions above. Once the Modge Podge is dry, put a string or ribbon through the hole in top of the ornaments. 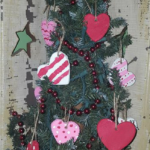 They are now ready to hang on your Valentines Day Tree. Storage Tip: Wrap each salt dough ornament individually and place them – neatly stacked – in a plastic box such as a plastic shoe box. Use plenty of packaging material and do not put any other types of ornaments in the same box. These ornaments are breakable.